Low wattage LED lighting is becoming a very popular data center lighting solution because LED's work well in cold environments and they measurably reduce cooling costs related to hotter higher wattage previous generation lighting technologies. Data Centers less than 150,000 square feet that utilize chillers for HVAC get special tax benefits under the EPAct tax provisions. 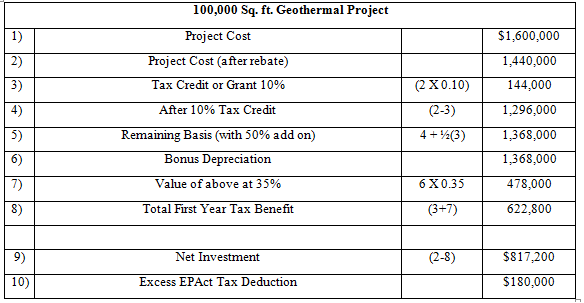 These special benefits arise because the EPAct tax calculation utilizes less efficient package units in the ASHRAE reference data center building comparison as compared to measurably more efficient central chillers. 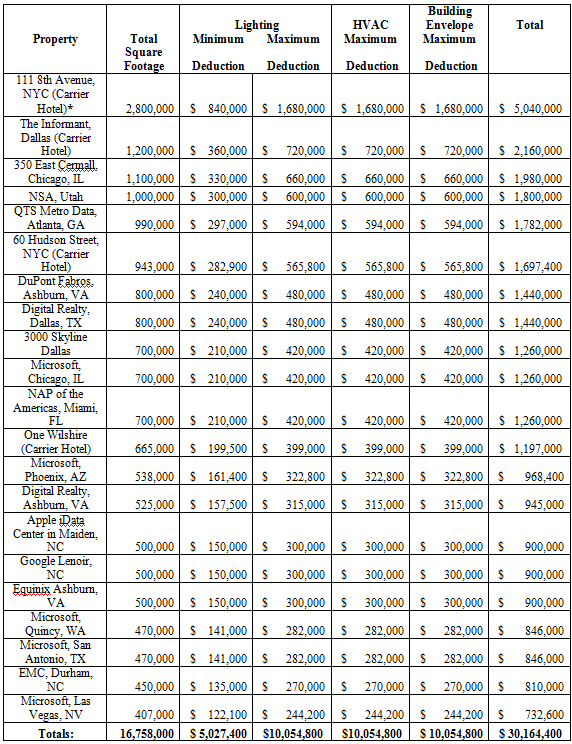 Virtually all data center LED Lighting/ Chiller combinations for all data centers less than 150,000 square feet buildings will qualify for at least a $1.20 per square foot EPAct tax deduction and many will qualify for $1.80 per square foot EPAct tax deduction. 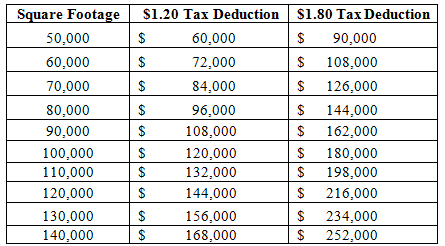 The following table presents the EPAct tax deduction ranges for LED/chiller combinations starting at 50,000 square feet. Large data centers consume vast amounts of electricity and can save substantial operating costs and qualify for large EPAct tax deductions by combining LED lighting and very energy efficient HVAC such as geothermal , thermal storage , and very high energy-efficient chillers. IRS notice 2011-14 enables data centers that previously missed eligible EPAct tax deductions to recover these incentives for both new centers and existing building data center conversion projects completed since January 1, 2006. This is particularly important notice for data centers because the data center facility sector has experience explosive growth since January 1, 2006, both for new data centers and for existing building conversions to data centers. Large data centers and carrier hotels consume vast amounts of energy and are excellent candidates for onsite alternative energy electricity generation. In an information technology driven economy data centers have become a fast growing facility category. Data centers use substantial amounts of electricity and now find themselves under the microscope regarding energy consumption. New energy LED lighting technologies and high efficiency chillers can materially reduce energy use in these facilities. Fuel cells are becoming an increasingly popular way to supply on site electricity to these facilities. All three upgrades meaning LED lighting, high energy efficiency chillers and fuel cells typically qualify for large tax savings.